With Iku being released, I've been working on the next IZ character: Youmu. The biggest change to Youmu from GR is that her Spirit Level mechanic has been removed, so her gameplay is a bit more simplistic this time around. Completely reworked the way Insightful Sword functions and is now her Unique Skill. Instead of a counter like it was in the source games and GR, it now functions as a parry. Crescent Moon Slash (623p) isn't a new move by any means, but the biggest change is that it's now air usable, which she couldn't do in neither Soku nor GR. Intolerant Avici (63214p), Youmu's command grab Alt Skill from Soku. Unlike Soku, it has no automatic followup, but doesn't scale anywhere near as hard nor does it push the opponent as far from Youmu, making it more suitable for starting combos and adding to Youmu's pressure game. Unlike Soku, Youmu will always switch sides with the opponent regardless of which version is used. Now costs 2000 Power. Damage has been scaled up to match the new cost, and the command has also been changed to the more complicated QCB,HCF+p motion. The train now has its own hitbox, instead of sharing one with Yukari. Likewise, the train now also spans an entire screen width, instead of only hitting the area in front of Yukari. No longer startup invincible; however, Yukari now has invincibility starting when the train first appears, until it explodes. As a side effect of the above changes, the train now persists on-screen when using the Type-C alignment's Dash Cancel, instead of prematurely preventing the explosion as it currently does. 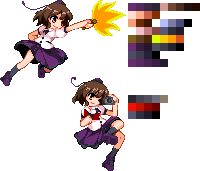 Due to this, Yukari will be getting another lv 1 Spellcard to replicate this move's old functionality. Hope you all enjoy fake news because the next character is none other than Aya Shameimaru herself. So just as a rundown, Aya is going to be a charge character, so what better way to show her off than with... a non-charge motion Special? Anyway, Gust Fan is her staple projectile lifted straight from SWR/Soku. Unlike the source game, however, she can now fire them at different speeds, instead of all versions being identical. Hey I'm down to beta test again!! Okay so now we have an actual charge Special, her signature Dominating Dash. It doesn't possess any projectile invincibility unlike source, but it's still air usable. Much like a certain similar move from an unrelated series, it also possesses the unique property of dealing 2 hits on block only, not that you'd want to have this move blocked, but I guess having it be much safer than without this property is better than nothing. Part 1/2: Tengu Drum and Tengu Felling, both from SWR/Soku; if you've ever played M.Bison in any of the Street Fighter games, then you should already have an idea of how these moves work. Tengu Drum more or less works the same way in Soku, however, Tengu Felling has been redone to be more along the lines of the way Bison's Skull Diver works. She'll also have a equivalent move to Devil's Reverse, but that will be for part 2. Part 2/2: Tengu's Downburst; effectively Aya's equivalent of Bison's Devil's Reverse. Like Bison's SF5 counterpart, it doesn't have it's own separate command, but rather is used during Tengu Drum before Aya makes contact with the opponent, giving her an option to either commit to the move or prematurely cancel it into an attack. Also shown is a slight revision to Tengu Felling, where it no longer causes a knockdown against grounded opponents. Aya's Last Word: Illusionary Dominance. I usually take creative liberties when it comes to adapting moves from source and Aya's Last Word was no exception: rather than having the move have you adjust Aya's height with directional inputs and thus result in some inconsistent behavior that risks having p2 drop out of the move, Illusionary Dominance now automatically tracks p2's position. The final stomp of the move wasn't originally present in source and was something I added for an extra "Oomph" at the end, as well as making yet another reference to M.Bison. Finally got to Aya's color separation. "I've got the power of gods and anime on my side!" Okay, maybe not the former, but Sanae is next. As you can see here, her game plan is a bit simplified now and may require a bit of an explanation: Going into making the Incident Zero characters, by initial plan was to correlate influence with the newer Touhou fighters (HM, ULiL, and AoCF), which can obviously be seen with Yukari and Reisen, who largely take inspiration from their AoCF counterparts, rather than Soku. Even characters who didn't gain as drastic of a change in moveset, such as Reimu and Marisa, also take inspiration from the newer games as well. Back when I was doing IZ Sakuya, I thought about this and wanted to take it in a direction of "since Sakuya wasn't in any of the new fighters, if she were to reappear as a playable character in AoCF, what changes would she have gotten?". As a result of that, Sakuya's moveset was changed, but not too drastically to the point where she would no longer be Sakuya. This same train of thought is also present in IZ Sanae: As you can see from the HUD, she no longer utilizes Kanako or Suwako in any of her moves. She still has a wind mechanic, which is now her Unique Skill and is now indicated by tornado stocks instead of a gauge. Now I'm going to go off on a tangent here and go a bit into some development backstory. 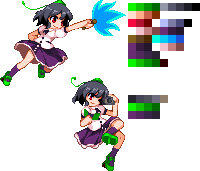 Back when I was collaborating with Midori Margatroid on a Sanae in 2014, we analyzed Sanae in Hisoutensoku, and pretty much came to the conclusion that her wind mechanic in that game was lackluster and not well thought out. What we couldn't agree on, however, was how to approach it: Midori wanted to try to stay as close to the source as possible while simultaneously fixing the flaws we saw with the system, while I wanted to completely revamp the system to make it more akin to Rachel's version of the mechanic in the BlazBlue games; we ended up using the former idea, which culminated in some of the changes present (ie: the ability to cancel into the Wind Summoning at the expense of power, the ability to use it on the ground, etc). In the end, we still felt like more could be done. 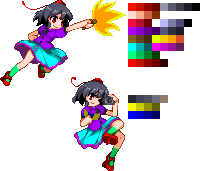 When I eventually made the Gensokyo Reloaded version of Sanae, I decided to explore the original route I wanted to go and ended up using that system. In the end, I felt like it was a natural progression. So stemming from that, IZ Sanae will progress the system a bit further, by giving her additional options to utilize her wind, which will serve as the focus of her gameplay this time around, in lieu of her Kanako & Suwako assists. What like person Sanae is (or at these stories? ) Them all... seen cute... and high class magic. Sanae's new 6z command normal, based on her heavy bullet from Soku, replacing her old 6z command normal from GR. It has similar functionality as a zoning tool, and unlike its source counterpart is affected by wind, giving her another wind option. Sanae's new 4z command normal. Its main use is as an anti-air, but since the mechanics of the IZ system cause her back throw to come out if this move is used up close, it creates an option select where the opponent either stays grounded and gets grabbed, or jumps and gets hit by the anti-air command normal instead. it creates an option select where the opponent either stays grounded and gets grabbed, or jumps and gets hit by the anti-air command normal instead. Sanae Kochiya? Anyway.. Why i don´t fin Aya Shameimaru at that other list?